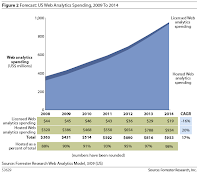 Forrester just released the "US Web Analytics Forecast, 2008 to 2014". John Lovett, Forrester analyst, predicts the US web analytics market will reach $1B by 2014, with a steady and amazing growth of 17% per year! Data from the Web Analytics Solution Profiler (WASP), a service that detects analytics solutions installed on Web sites, projects that market penetration for Web analytics is roughly 58%. WASP also estimates that 78% of total market share is currently held by free vendor solutions. Further, among sites that have installations of fee-based Web analytics tools, 37% also have free tracking products installed, thereby duplicating their measurement efforts. Data referenced in the Forrester document was based on a sample of 210,820 sites analyzed over a one-month time period between February 2009 and March 2009. I you are a vendor seeking market share information or competitive data, an agency looking for business development opportunities or a market analyst, contact me to tap into the unique and valuable WASP market data. I got my hands on an advanced copy of the research and my feeling was simply "wow!" I can already hear people complaining "yeah, right... I knew that", the difference here is the level of detail, the trust and confidence you can put in this 10 pages document. The abstract says "the promise of web analytics needs an adjustment" and goes on to detail the specific points justifying such a statement. "The future success of web analytics is dependent upon experts who translate raw data into insight". If only a fraction of professional services are delivered by vendors, the market for experienced consultants will continue to be in high demand. "Data becomes the addictive drug because it can demonstrate success, predict outcomes, and establish business cases for new endeavors.". Web analytics is not a matter of ROI, it's a matter of accountability. "The importance of integration is accentuated": during initial client meetings there is always a point of integrating everything... they quickly hit a roadblock because their web analytics maturity is simply not there. "Optimization technology will be the next frontier": I would rather say "automation & optimization". We should always aim to automate tasks and transfer our knowledge into intelligent systems that will free us to work on the next challenges. Being an independent consultant, I particularly like the statement that "professional services will be delivered from non-vendors providers".